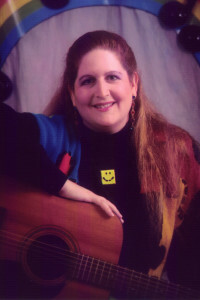 Judy Caplan Ginsburgh has been performing children’s music since 1981. In this episode of Confetti Park, we hear a special childhood memory from Judy Caplan Ginsburgh of Alexandria, Louisiana, an internationally recognized and multi-award winning performer, recording artist and educator. Judy sings as a cantorial soloist and travels throughout North America presenting concerts, residencies, educational keynotes and workshops. Judy works actively in both Jewish and non-Jewish settings and she has developed a number of interactive, educational performances and arts-in-education residencies for school-age children. She has been creating children’s music since 1981! Judy shares how important the validation of adults can be when it comes to nurturing a child’s natural talents and interests, and how an experience that happened when she was just eight years old set her on a career in music! Says Judy: “We had a music teacher who came to our school maybe every other week, and she would do music with all the children in the school. At one point our local symphony here in Rapides parish needed a children’s chorus… and they auditioned people at our elementary school. I remember a gentleman coming, he listened to all of us, and we sang, I think, “Happy Birthday.” And we sang in groups of like five. And he walked in front of us and listened to us, and picked certain people to be in this children’s chorus. I was one of those that was picked, when I was about 8 years old, and at that moment, I knew that I was good. That my voice was good. Someone had validated me….. Thank you, Judy, for sharing your childhood music memory with Confetti Park! Learn more about Judy at http://www.judymusic.com/ and check out this more in depth interview with Judy.